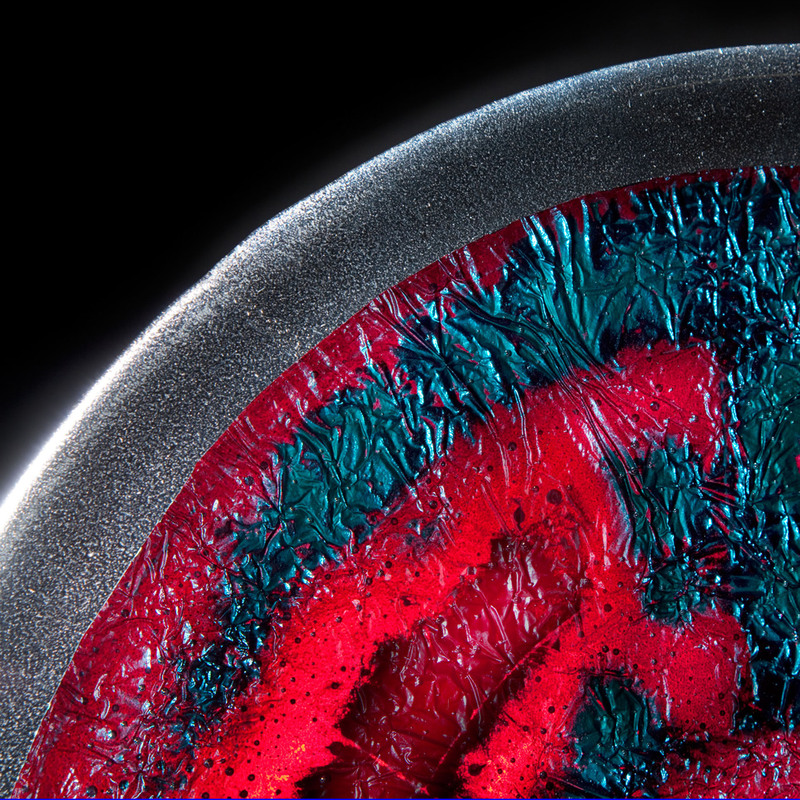 Detail image showing the texture and translucent color of the copper inclusion cast in glass. By controlling the oxidation of the copper I can transform it into a transparent material with brilliant blues and reds. For me there is no better way to truly understand and embrace a medium than to push the limits of what you can do with it. I experiment a great deal in my studio; trying new materials, techniques and processes, developing new patinas and finishes, doing destructive testing and the like. Of all the mediums I work in, I’ve done the most experimentation and testing with glass. 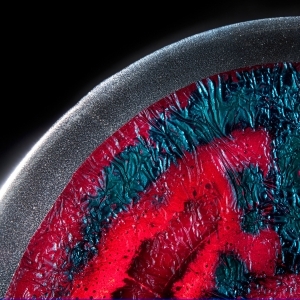 Azurite is the result of months of tests encapsulating different materials within molten glass. These tests led to some wonderful discoveries, one of which was, by exercising extremely precise control of numerous variables, I can transform normally opaque metals into a translucent material. This was a pretty radical discovery and it took a fair amount of detailed testing to master and control the outcome. For Azurite I choose to encapsulate copper. By controlling the oxidation of the copper during casting I created beautiful cobalt blue hues, that when back-lit become brilliant shades of red. The copper also allowed me to add texture within the casting, this, combined with small bubbles in the glass, creates a wonderful sense of depth and richness. I’ve used this technique to create a variety of light sculptures that appear solid and opaque when off and vibrant and colorful when illuminated.